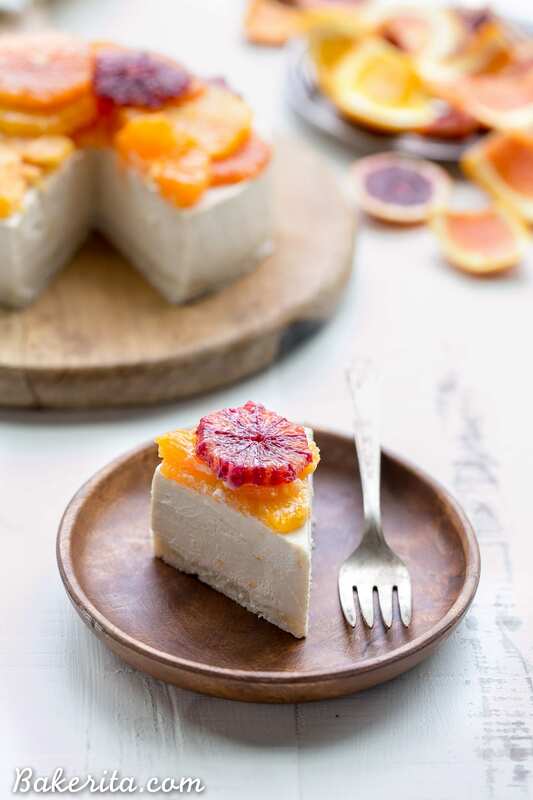 This No-Bake Lemon Cheesecake is a cashew-based raw, vegan, and Paleo cheesecake adorned with slices of juicy citrus. It’s incredibly creamy, a little tangy, and lightly sweetened with maple syrup. Based on the number of citrus recipes I’ve posted over the many years I’ve been creating recipes, you would think I really didn’t like citrus. I really haven’t posted a recipe starring citrus in looooong time. You’d think I wouldn’t like citrus, based on that – right? Well, nothing could be further from the truth. I buy bags of citrus during the winter, and stock up on allll the different kinds every week at the farmer’s market. I marvel in their bright flavors, and the flavor nuances between a Cara Cara orange and a Navel, a tangerine and a clementine. It just all goes straight from peel to my mouth, and never ever makes its way into a recipe because I’m too busy enjoying how good it is all by itself. 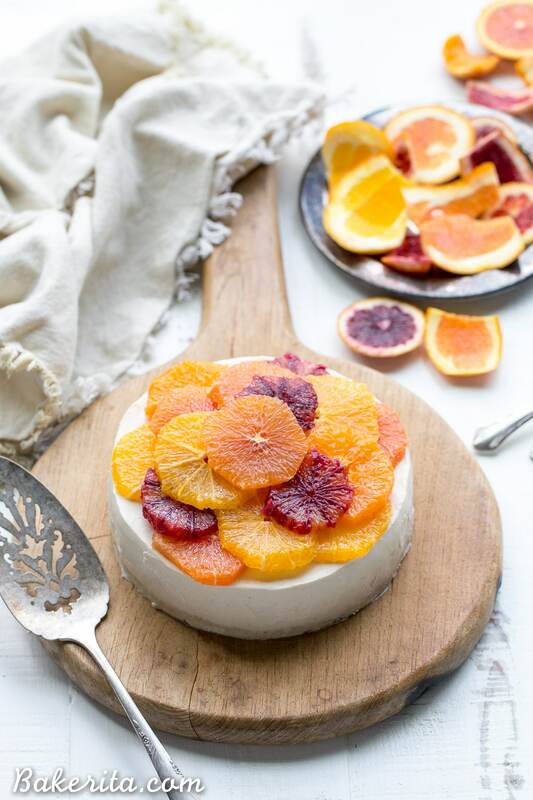 Also, citrus desserts usually tend to be too sweet for me – the sugar always overpowers the tartness that I so love about lemons, oranges, and grapefruits. 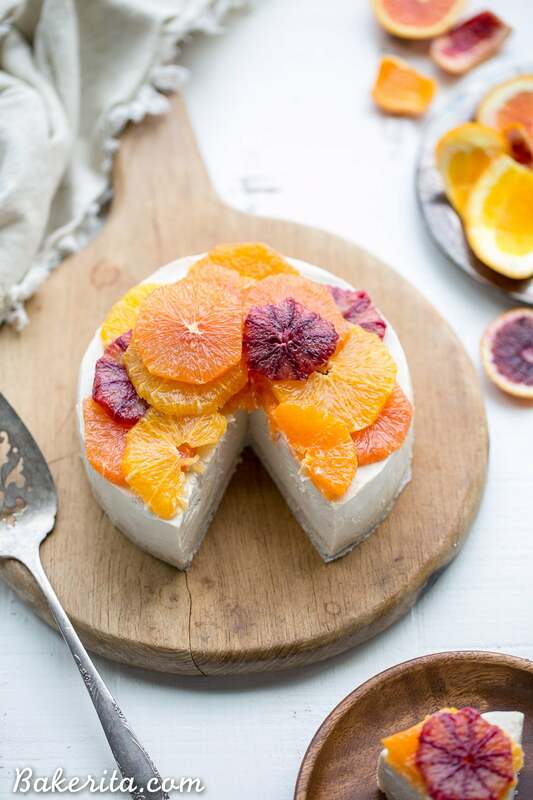 As I was eating my Cara Cara oranges one day though, and the slices looked so juicy and beautiful, I knew I had to make a citrus dessert that highlighted how stunningly beautiful citrus is. I’d been having a hankering for a lemon treat, and I knew I could decorate a lemon cheesecake simply and beautifully with citrus slices, so this no-bake lemon cheesecake came into being. It’s a vegan, raw cheesecake, using with soaked and blended cashews to form a super creamy base. The lemon flavor adds brightness, which is mellowed out by the creamy coconut cream. Maple syrup adds a hint of sweetness, too. The silky smooth cheesecake filling is smoothed on top of a lightly sweetened coconut & almond flour crust. After a stint in the freezer, the lemon cheesecake is firmed up and ready to garnish. Because citrus are best when they’re freshly cut and super juicy, I’d recommend waiting until just before serving to garnish with the citrus slices, because you don’t want the citrus to have to go into the freezer and get icy. I used a variety of citrus that I had in my produce drawer: blood oranges, Cara Cara oranges, Navel oranges, and clementines. 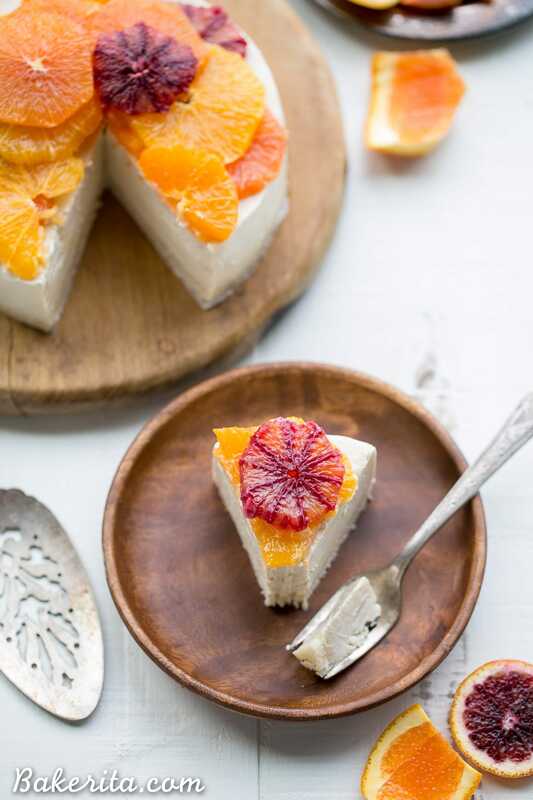 I love the variety of color and flavor that the pink Cara Cara’s and the red blood oranges bring to the look of the cheesecake. It make sure the citrus didn’t bleed all over the cheesecake and make it wet, I laid the orange slices in between sheets of paper towels to dry them of their excess juices. Then, I just laid them out, forming a little bit of a pyramid shape with the slices in an arrangement I liked. Taking my first bite, I was in love. The lemon cheesecake is super creamy and smooth, and it just melts in your mouth. The fresh oranges on top add a burst of juicy brightness that makes everything exponentially better. While I’ll definitely be saving my citrus for eating plain too…some of my stock will definitely be going towards more citrus recipes, now that I’ve been enlightened to how amazing they can be. I hope you all love this one as much as I do! Line an 6” or 7" pan with strips of parchment paper for easy removal, and grease well with coconut oil. Set aside. In a mixing bowl, stir together the shredded coconut, almond flour, melted coconut butter, melted coconut oil, and maple syrup. Press the dough evenly along the bottom of the prepared pan. In a high-powered blender (I used my Vitamix, but most powerful blenders should do the job), combine all of the filling ingredients and blend for about 2-3 minutes, or until the mixture is silky smooth and creamy. You may need to add a bit more coconut milk or lemon juice to get it to blend smoothly if your blender isn’t super high-powered. Once it’s smooth, taste the mixture and adjust the sweetness/tartness levels, if desired. Pour the filling into the prepared pan over the crust and smooth the top. Place in the freezer to set for at least 3 hours or until completely firm before garnishing, slicing and serving. For the garnish, use a parish knife to peel the citrus fruits. Slice the citrus, and dry each side with a paper towel. Arrange on top of the cheesecake. I recommend doing this right before serving, so the citrus is freshest. When serving, I recommend running your knife under hot water to warm it up before cutting the cheesecake with the still-hot (dried) knife. Serve frozen or let them thaw at room temperature for 10-15 minutes before serving. Store in the freezer for up to 2 weeks. I hardly ever make citrus desserts either, but I do love all kinds of citrus. Hooray for a no bake cheesecake! This looks perfect to use up all of that fresh fruit with, and as a reminder that spring is on the way! Can’t wait for those warm spring days. Thanks Gayle! Wish I could share a slice with you, Sarah! Thanks for your kind words, lovely. Rachel, this cake is so pretty! We have to gobble up all the citrus before it’s all gone for the season. So so true! Thanks Annie. You need to try cashew cheesecake, Traci! I have a feeling you’d do amazing things with it :) thanks for your kind words! This is so pretty, Rachel! 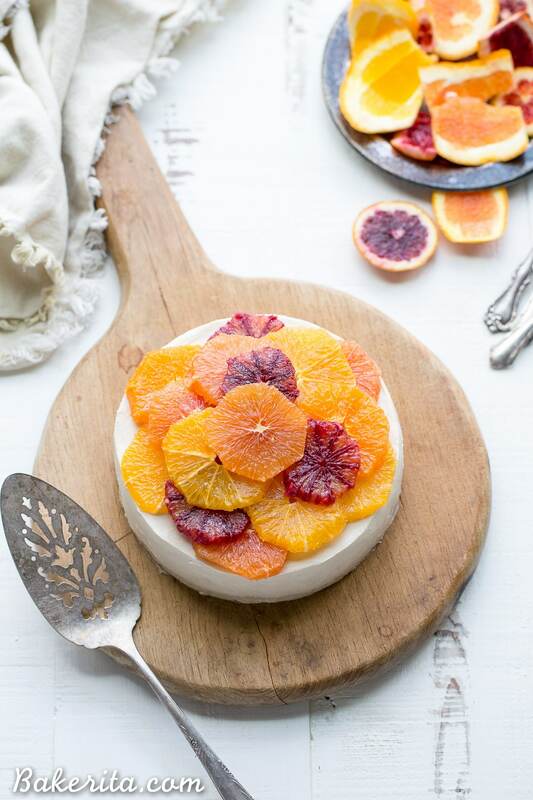 I love no-bake cheesecakes, and all that winter citrus is just fab! Thank you so much Natasha! I seriously can’t get enough of citrus this time of year. I’m with you, I love citrus, but I rarely post about it. This cheesecake looks SO good!! Chocolate is my number 1 favorite, but citrus desserts is right behind it! 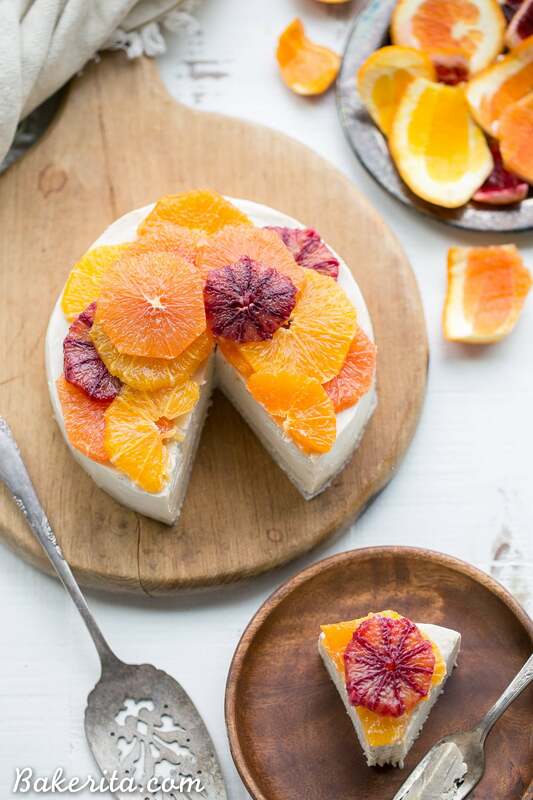 This cheesecake is so pretty, and the perfect use for all the gorgeous varieties of citrus right now! You continue to amaze me with your creativity, Rachel. 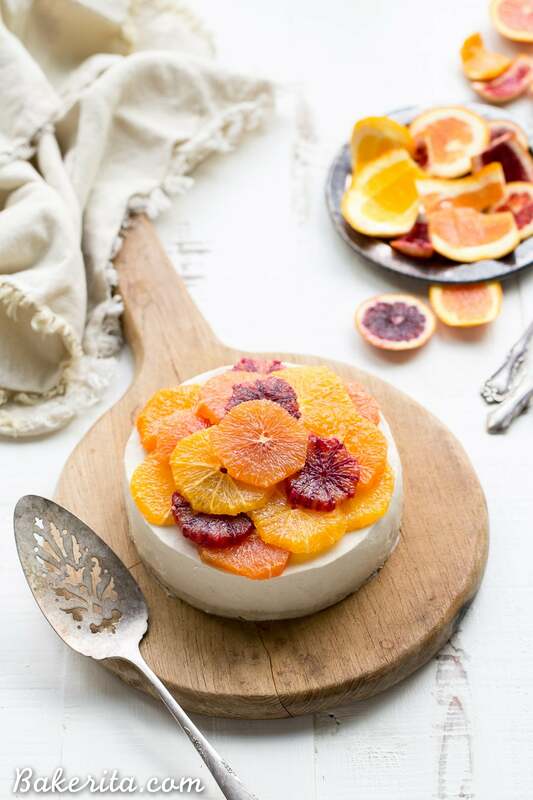 This dessert is absolutely beautiful, I love the citrus zing, the texture looks perfect and somehow you’ve waved your magic want to make it so nutritious too. Thanks so much Laura! I can’t get enough of citrus right now. I am a huge citrus fan too. I really could use a slice of this cheesecake right now. I’m imagining how creamy and bright it tastes. I love citrus and really enjoy using it in my baked goods (when I’m not eating as it). Cara cara oranges happen to be one of my favourites. This cheesecake looks divine and how could it not put a big smile on your face when you look at it? Helloooooo spring!! Aren’t cara caras the best?! I’m in love with them! Thanks Dawn. These cheesecakes look super gorgeous! Recently, I discovered blood oranges, and they’re so pretty and tasty. I really like the food styling on top of the cheesecakes. Thanks so much, Elaine!! I appreciate it.